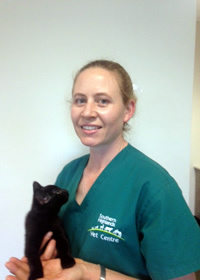 Claire started working with us in September 2015 and has been a fully qualified veterinary nurse for 14 years in which time she also trains & assesses veterinary nurse students at Tafe. Claire has also completed her Bachelor of Arts in Community and Environment and Post Graduate Diploma in Primary School Teaching. In her spare time she enjoys playing her violin, cooking and working on her 100 acre farm with her dog ‘Allan’ and cat ‘Maurice’.